Carte de Visite photographs are small prints mounted on cards that are roughly 2-1/2 by 4 inches. The predecessors of the Carte de Visite were calling cards. Calling cards were used in the same manner as today's business card but were slightly smaller. In 1854, Andre Adolphe Disderi was the first to devise a way to make Carte de Visite multiple images or portraits on a single photographic plate. This called for a new type of camera with a shifting back. Each time the back was moved, a different portion of the plate would be exposed allowing a set of several images to be printed at the same time. Some cameras used anywhere from 2 to 32 lenses while still others had both shifting backs and multiple lenses. These cameras soon were referred to as Multiplying Cameras and were very efficient at producing numerous images in a short period of time. 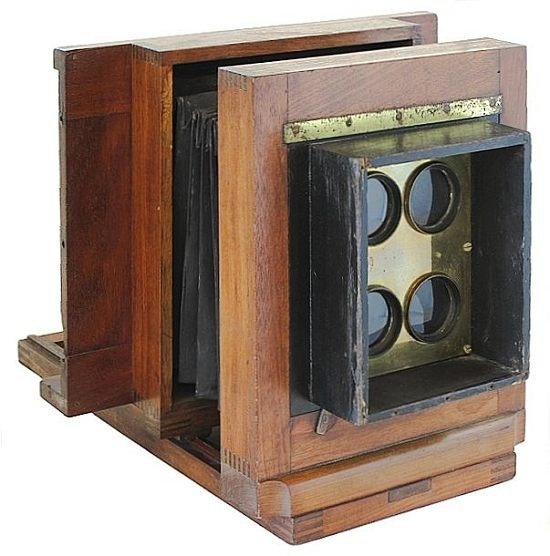 Multi-lens and multiplying cameras were popular from the mid-1850s to 1870s and continued to be made through the early 1900s. Wet plate, multi-lens cameras are rare and prized items. The wet collodion process required that a plate be coated just before taking a picture. The entire process of coating the plate, taking the picture, and developing the image had to be accomplished while the collodion was still liquid (wet). Regardless of how careful a photographer tried to be, the collodion would always drip through the plate holder and inevitably get on the camera. The presence of stains is considered a desirable "badge of honor" and adds character to the camera's appearance. 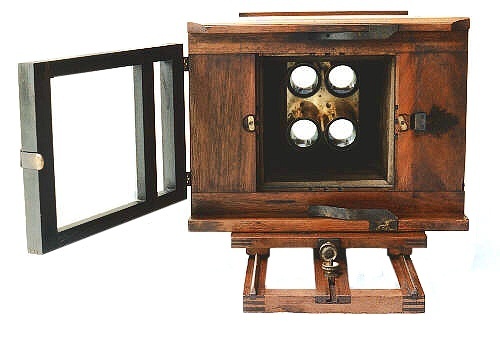 plate camera with four Darlot No.4 lenses. Collodion stains are very evident on the large brass plate-holder retaining springs and wood. Heavy brass tarnishing and large stains on the wood back would indicate that this particular camera earned its keep. The original wood color can also be seen as the lighter colored vertical area to the right of the lens chamber. A wide back allowed the photographer to reposition the wet plate-holder for multiple images.